What is a Conditional Statement? A conditional statement is a coder’s way to ask a question, and depending on the answer, do one thing or another. Any time you use the IF or CASE functions (e.g., in formula fields, advanced workflow rules, etc.). These are full-blown, in-your-face conditional statements. IF X is true, THEN do Y, otherwise (ELSE) do Z. In Apex, these types of conditional statements are called IF-ELSE statements (the same type of statement in Java is called IF-THEN-ELSE). But before we dive into how Apex does things, let’s look at something more familiar to us as admins … how we use a simple conditional statement/function in a formula field. In real life I’d be pulling the totalTime value from my database, but I wanted to keep things simple … go with me on this. ** In case you’re wondering why we declared totalTime as a Decimal variable instead of an Integer variable, this is because Integers can only be whole numbers, while Decimals (or Doubles) can have a decimal point value. For more on this, check out my post, Primitive Data Types in Apex and Java. 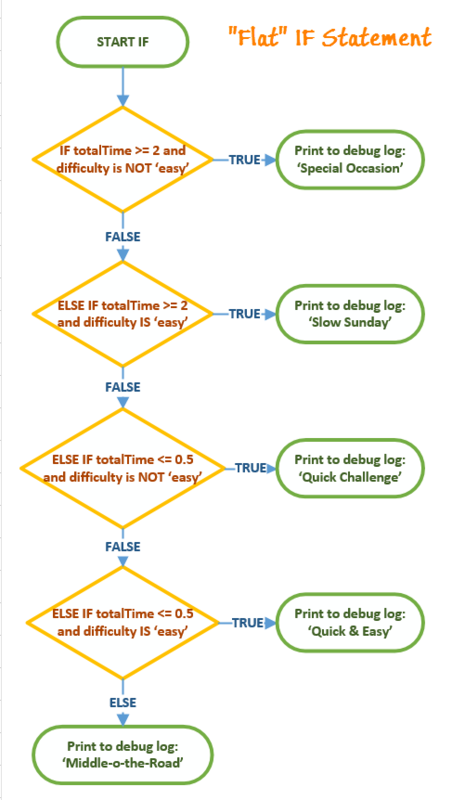 If we had set totalTime to equal 1.5 (or really anything less than 2), then the condition would be FALSE and the debug log would have printed a debug line of “Quick & Easy“. One difference between the declarative version of the IF function and the Apex IF-ELSE version is that Apex doesn’t actually require the ELSE part of the statement. That means, that you could have choose to run code if the statement is TRUE, and do nothing if it is FALSE. As we know, I generally go for less typing so, no surprise here, I prefer the first version. How’s that for short and sweet!? Way short and super sweet! But what would happen if we wanted to have more than two options, or if the criteria was a little more complicated than this? Let’s take a look at how we would handle that in Apex. We want to get a little more sophisticated in our conditional statement. As you can imagine, just because something doesn’t take much time to make, doesn’t mean it’s particularly easy to make. What about those recipes that take less than two hours, but are pretty complicated and require mad cooking skills? What we need here are some additional categories, which will involve more than just one criterion. We’re going to see a few different ways to write this, and at the same time, show you how to nest IF-Else statements. The first version of code I’m going to show you is the most literal translation of the categories above. For each of the rows above, we have a separate conditional statement. You can see that we’re using the ELSE IF clause, to specify additional conditions and subsequent code to run if they evaluate as TRUE. // If the total time is greater than or equal to 2 AND the difficulty isn't 'Easy" then it's a Special Occasion. This example describes one of my favorite recipes, Minestrone Soup, a perfect Slow Sunday recipe! This is perfectly legitimate code, but as many things in coding, we have options. 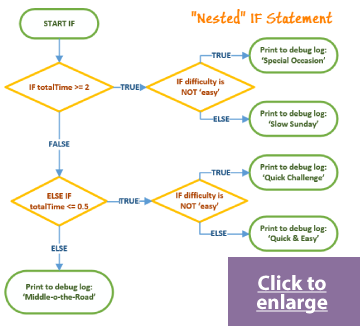 Let me show you another way to work your IF-ELSE statements … by nesting them. You may have noticed there is some redundancy in our code above; we have two lines that have conditions that include the total time >= 2 and two lines where the condition includes total time <= 0.5. Again, there is nothing wrong with this, but let’s try this another way, this time using nested IF-ELSE statements. Just like when you nest IF functions in a formula field, you can also nest IF-ELSE statements in Apex. Which Version Should You Choose? So great! We have options … but why would you use the flat version versus nested? To some extent it’s a matter of style and personal preference. The first version (flat) is easier to read, but there are some minor processing speed advantages of both of them, under different situations. Then the flat version would only need to process through the first decision node, to know what code to run; the nested version would need to process through at least two decision nodes. However, what if you had larger code segments that would run any time the totalTime was 2.5 or higher. In the flat version, you’d need to repeat this code in every section that related to that length of time. Not very efficient. Also, if you need to make a change to the code, you’d need to replicate that change in all the different places you had the repeated code. Again, not efficient! This, then, would make our code a good candidate for the nested version of the IF-ELSE statement. Then you have only one place to put this code, and therefore one place to manage. Much better! So, as you can see, there are no hard and fast rules on which version (flat or nested) to use. Personally, I tend to default with the flat version, because it’s easier to read, unless something in my code that speaks to the nested version (e.g., repetitive sections of code). I hope you’ve had a fun time cooking up some conditional statements in our coding kitchen. I also hope that you see you are just a short hop from the declarative dining room into the exciting world of the coding kitchen. Are functionally very similar to using IF functions in formula fields. Use one or more Boolean conditions that if evaluate to TRUE run code. Can have just one condition, or a string of conditions (ELSE IF conditions). 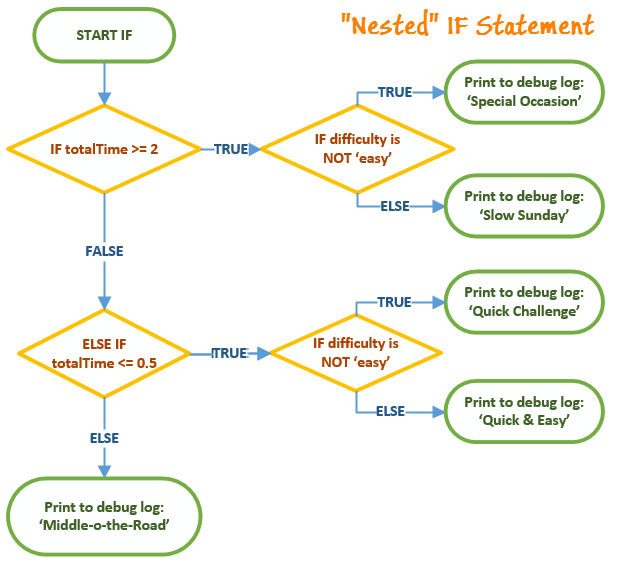 Can include code in an ELSE statement that will run if none of the IF or ELSE IF statements evaluate to TRUE. Phew! I hope you found this a light yet satisfying episode of Cooking with Code. Hope to see you again! Until next time … Bon Appétite!